I’ve been trying to do more of my errands by bicycling, and one of my biggest holdups has been a lack of cargo room: it’s hard to lug home 80 pounds of cat litter in a backpack. So, a few months ago I started shopping on Craigslist for a bike trailer, only to find out that a good friend had one in her garage that I could have for free. 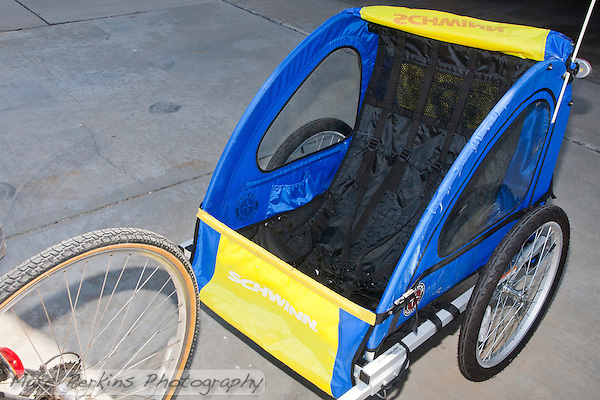 My Schwinn Spirit bike trailer before modification. 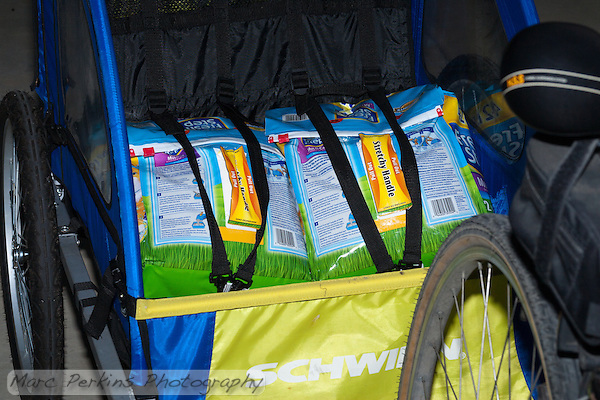 Two 42-pound bags of Fresh Step cat litter strapped in like kids into my bike trailer's child harness. So cute! An unexpected bonus of the trailer is that whenever I have it attached to my bike, cars give me more maneuvering room. I bike on city streets in Orange County, CA, and am used to having only a few inches of space between my side mirror and the cars zipping past me. But when I’m using the trailer, most cars will actually change lanes before even attempting to pass me (or at least give me four or five feet of clearance), and I’ve had multiple people literally stop to let me go in front of them. Amazing. But using the trailer for cargo has proved to be less than ideal, as the bottom of the trailer is just made of soft fabric: the kids’ weight is designed to be supported entirely by the harness (which is hung from a horizontal metal rod). So, unless I had cargo that was perfectly sized to fit into that harness (like the bags of cat litter), I was limited to low weight. 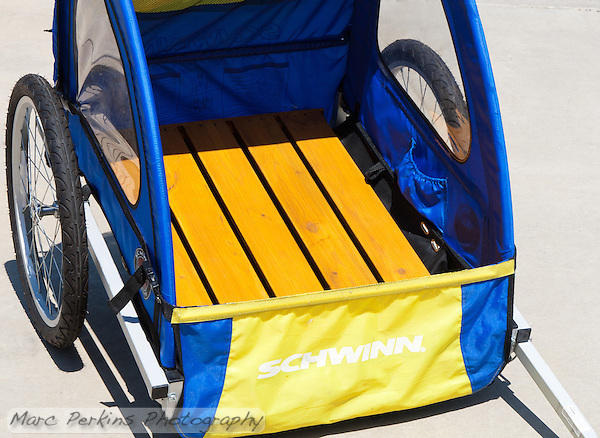 The bottom of the Schwinn Spirit bike trailer (with the child harness removed) is just thin fabric: not good for cargo. So, I wanted to modify the trailer to add a solid base to convert it to a cargo trailer, and while I found lots of DIY tutorials, they all involved removing the fabric. 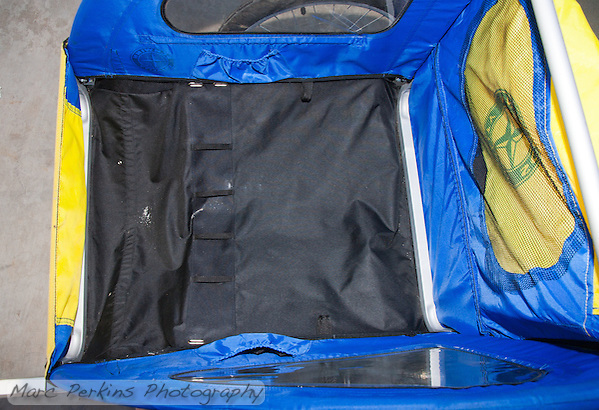 However, I wanted to keep the fabric on my trailer to protect my cargo from weather and prevent it from blowing around. Additionally, my guess is that the extra space I’m getting when I use the trailer is due to both the visual bulk of the trailer (it’s actually the same width as my handlebars, but makes my bike look much wider) and also because people think there are cute wittle children in the trailer and thus are panicked about the possibility of hitting them1. Read on for full instructions on how I built this!